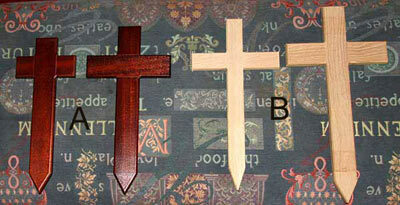 Tree stakes and wooden crosses for memorial plaques - Backing boards and oak frames for wide range of signs. 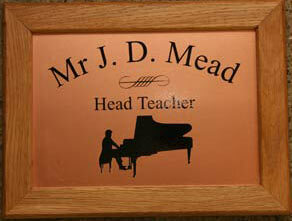 Backing boards are made from various timbers including Oak, Iroko and Sapele. If you prefer a particular wood just let us know on the order form. These can be screwed on the wall or hung from brackets. 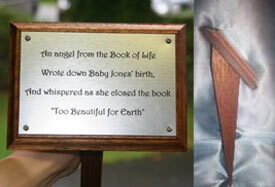 Our carpenters will make them up to fit the sign or plaque. The oak can be finished with 3 coats of Danish Oil or a black wood preservative. 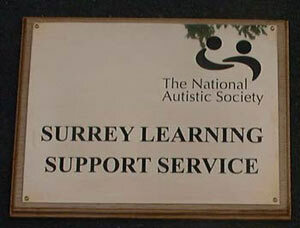 eg if the sign is 150mm x 150mm it will need 600mm or 0.6m of timber. 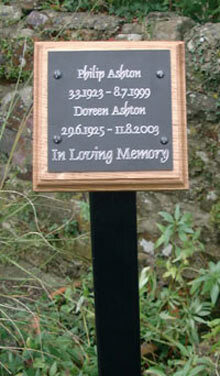 These are of a professional quality and are made from black powder coated iron. The stake is 23.5 inches high with the spike. It is also supplied with a re-enforcing pin to be use when mounting in concrete. The face tilts upwards and has two holes in it for mounting the backing board. As the face is 4" in height the minimum height of the backing board must also be 4". Made from oak treated with black preservative. Not as strong as a metal stake but a good alternative. 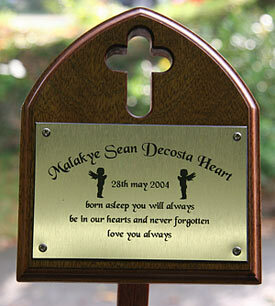 Can take any engraved material up to 90mm high and 140mm wide.